During WW-1, while occupying the Belgian coast, the Germans were afraid that the allies would attack from the Netherlands. They constructed a defenceline along the entire Nl-Be border in 1916-1918. The part from the coast to Antwerp was called the Hollandstellung. 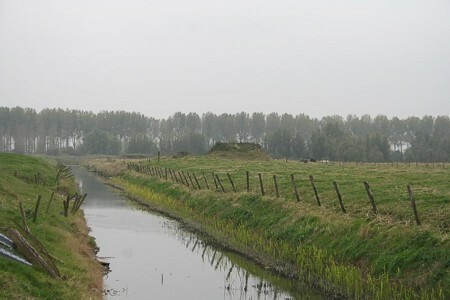 The defences from the coast until Strobrugge (Maldegem) were built by Marinekorps Flandern. The rest was constructed by A.O.K. 4, which led to different kinds of layout and bunkertypes used in both sections. Small parts of this defenceline were re-used during WW-2. Additional photos by Lex Weijerman (2007). In some parts a tankditch was made. This is at the Roden-Ossestraat. The trees at the back stand along the canal: Damse Vaart Oost.